Sundresses are the perfect item to wear in summer. I love light and breezy fabrics to keep me cool. Both dresses look fantastic on you and that bag makes your outfit pop. Love this bag and it looks so beautiful with these gorgeous dresses. Thanks Emmy! It was an awesome find! Okay, I think you are well and truly justified in getting the second dress for two dollars!?! That's almost free! LOL! Both dresses are so cute! You're making me miss easy breezy summer dressing! haha yes, I had to buy it at that price! Wow, 2$? That is a steal. And the outfit looked way more expensive in total. Thanks Anne! It was an awesome find! How wonderful you loved the first outfit so much! I'm not surprised as it is really beautiful and I can't believe the dress was only $ 2! I love also the other look, this dress is beautiful, too, and the idea was great to pair it with the leo flats. Thanks Rena! it was a great find! Such cute dresses! And you can't beat $2!!! It's funny how stores differ from country to country even though they're supposed to be the same. I'd never buy clothes at our Kmarts, haha. Sad that your Target's aren't as good, but at least your Kmart has great stuff to make up for it! haha yes, they are completely different companies despite having the same name! We used to have KMart here (when I was a kid) and Target came and went very quickly. I love the floaty looks of both of these outfits, Mica, and agree with Sasha on how nicely the bag goes! I think you fins such great pieces in the thrift shops, it's no loss to you not having those stores there! I love the colours in this! These are the sort of dresses that you could casually wear out for a day exploring, but then could add a pair of heels to and then wear for an evening meal out. I love the versatile nature, and they're so cute! What a bargain! Fabulous find Mica! That pink and blue dress is super cute. Also what an awesome find on it. We no longer have Kmart in the states. They went out of business. Shame your Kmart didn't work - it's one of the biggest stores here! I think it is nice that you have one that is slightly more fitted and the other that is more swingy! They both look lovely on you! I certainly wouldn't have been able to turn down a $2 dress either! Pretty sundresses dear, especially the black one. Such a cute classic. Pretty contrast with the bag as well. The second dress you are wearing is so pretty and cute!!! I am looking forward to warm days so I can wear mine again!! 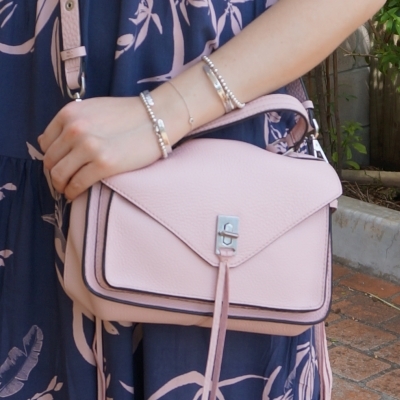 This bag is an utter dream, especially in the blush pink shade; super versatile! I love seeing your summer style when it's so cold over here babe :) Have a fabulous Christmas season!! I love that you wear so many dresses even on casual days, Mica!! The pearls and glittery shoes with the first one is such a fun way to give it some pizzazz!! They are just such a quick option when I don't know what to wear, haha! 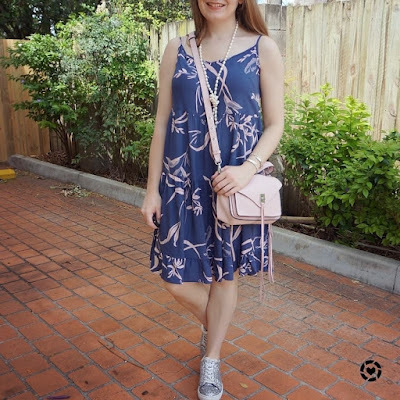 Love this RM cross body, and both of your sundresses are beautiful. So jealous it is so warm where you are!! That is a price which can not be beat! I love that your outfit is only $10 with out the bag! I can understand why you Kmart dress made you so happy it is super cute! Happy Holidays!!! Hahaha! I love that you paired the Minkoff bag with a $2 sundress which, by the way, is really cute. I especially love the black one! I love mixing high and low together! Oooh, both dresses are lovely! Aaaaand how cheap!!! I bought a very similar style dress to the first one for a Clara cosplay and it was SUCH a lovely cool dress to wear in the Summer- I wore it so much! I very much like the shape of the second one and the necklace you wore it with is so pretty!!! Thanks Kezzie! These are both so good for summer! Such cute dresses, Mica! !I love both of them! They look effortless trendy and I'm sure they can be easily paired with sneakers AND some nice middle-height block heeled sandals. I can'r believe the price of those gorgeoous glitter sneakers as well, I want them!!! The shoes were such a good buy! I'm glad I went back and bought them! Lucky you! I saw these once and didn't get a chance to try them on. Returned and the whole range was sold out and gone! Hahahaha! I've gone back numerous times but there isn't anything I really fancied. There's just something about those prints that make me swoon. Have a Merry Christmas Mica and I hope it's not too hot for you all up there! Hope you find some in a new print soon - they often bring new ones out, they are all so cute! 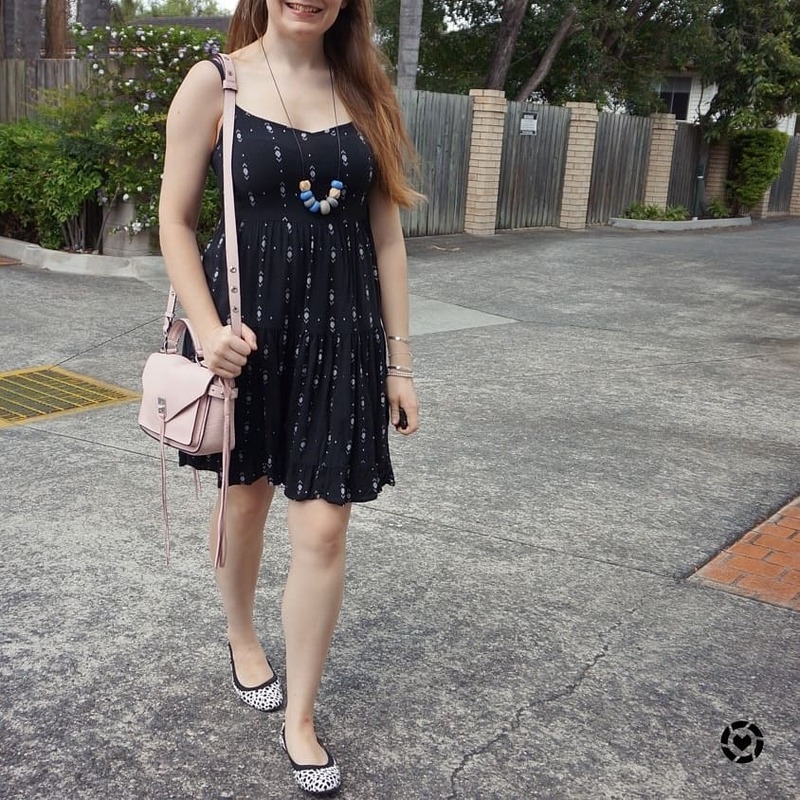 Such a cute summer dress! I think it looks lovely paired with your pale pink bag. Isn’t it the best when you find something that fits your style personality and the price is right?!? It’s a definite win, win and makes shopping that much more greater, lol. You look lovely in your dress. Can’t believe you got it from Walmart. Oops, not Walmart but Kmart! You see how surprised I am, lol? I can’t even get the store right. haha! It's a shame we don't have Walmart here! These glittery sneakers seriously go with everything! I never would have thought to pair them with a little sundress, and they look amazing! They do go with so much! It's hard to believe the blue dress was so affordable. It looks amazing and the print really suits you. I really like how the bag looks with both outfits. What a beautiful dress! Blue and pink is such a cute colour combo. I love how you paired it with that chic pink bag. The second dress is very pretty as well. I love both outfits, you look fantastic!!!! Dear Mica those two dresses are lovely ! You look fab in both of them, these are gret additions and with the pink bag even better.